Take that kangaroo « Hercules and the umpire. Qantas with no notice on-line or otherwise just cancelled our flight. The only way I found out is that the computer would not give me a boarding pass. Got a nice Aussie person on the phone who mumbled something about the crew needing to rest (after, I imagine, a night of drunken debauchery at the strip clubs in Dallas). Best laid plans and all. It is very early in the morning, but the good thing about gin is that everyone tells me that they can’t smell it on my breath even though they walk quickly away with horrified looks. Anyway, since Qantas is an inanimate object, the company’s high-handed behavior makes me want to smack the crap out of a kangaroo! Photo credit: Getty Image. 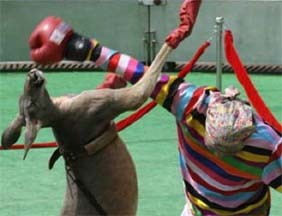 A kangaroo take a hard right that serves as a blow to the animal team’s claim of boxing dominance. Team human is represented by man in a clown suit at the annual Animal/Human Olympics in China. When the basic rules of contract no longer apply (thanks, Montreal and Warsaw Conventions), any excuse will do. But no doubt they are very sorry for your inconvenience. Sick humor notwithstanding, humans punching kangaroos is a disgusting and disgraceful event. Now kangaroos kicking the s! @# out humans that is welcome. Could it be that the kangaroos are getting even for you guys stealing their courts? Sorry. Couldn’t resist. 🙂 Have a safe flight (Qantas’s schedule says the plane is going out at 9:30 AM tomorrow), and they usually compensate you when it is their fault. I believe the ‘roos generally win their bouts versus humans. Maybe the delay is for the best, judge, considering how poorly you’ve been feeling recently. Best wishes for feeling better soon. One location in Australia today is 114F … quite a change from Nebraska. I hope they at least told you how important your call was to them and thanked you for choosing Quantas. I know a lawyer in Sydney if you run into any issues upon exiting the tunnel of the top three of those strategies. You ain’t getting any younger. Live a little, your grandchildren will need the advice. Keep it tight down there and enjoy the joy of the family.